The Miller QuickPick Rescue Kits are designed to deliver peace of mind during unexpected and stressful peer-rescue situations involving those working at height. The rescuer can remotely attach the system to the suspended worker while remaining securely anchored on the working surface. All rescue components are included in an easy-to-store kit with no assembly required - only an overhead anchorage is required. 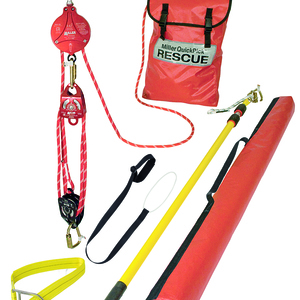 Designed with a back-up braking system to eliminate accidental release during a rescue situation, the kit includes all the necessary components to quickly rescue a fallen worker. 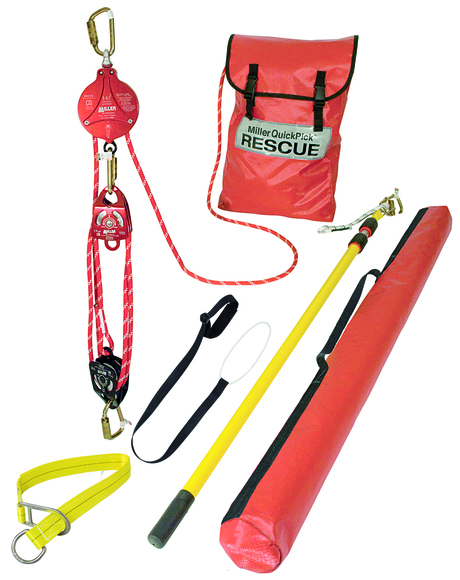 The kit contains: backup braking system; high-strength, colour-coded aluminium pulleys for easy orientation; 11 mm kernmantle rope; remote connection rescue pole that collapses to 1.2 m and extends to 3.6 m; carabiner clip and pigtail; tool lanyard; cross arm anchor connector; backpack for easy transportation; and carry case for pole. The Miller QuickPick Rescue Kits provide a professional rescue solution that can enhance worker safety and complies with corporate fall-protection plans by providing a quick and efficient rescue response. 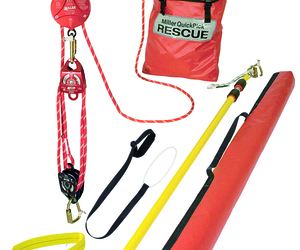 I am interested in Miller QuickPick rescue kits .